The 1947 Star of Hollywood incident did not happen over Newfoundland, but as the aircraft left Gander, then returned, a preliminary report was compiled and entered into the Newfoundland and Labrador archives. On 10 March 1947, TWA NC90814, Star of Hollywood, left New York City at 1353 GMT en route to Geneva, Switzerland with planned stops at Gander, Azores, and Paris (McGarth 1947). The aircraft landed in Gander at 2058 and picked up three additional passengers, making the total passengers 20 with 10 crew. The aircraft departed Gander at 2213 (AP 1947). The flight was normal until about 0030 on 11 March. The aircraft was flying at 19000 ft when the Navigator, George Hart, of Sag Harbour, Long Island, New York, was lost overboard through the astrodome. The weather at the time was clear with no turbulence, and the cabin was pressurized to 8000 ft., which meant the cabin was not pressurized to the maximum (McGrath 1947). A loud noise like an explosion was heard throughout the aircraft just before a rush of air passed through the vessel. Due to the cold air rushing in, a vapour formed in the aircraft, and the force of the air blew the doors to the galley open, knocking over the stewardess and flight purser. 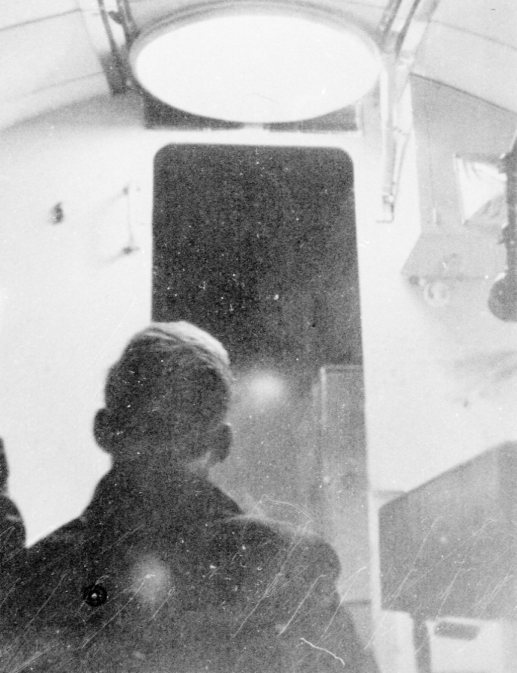 The doors to the navigator’s compartment were ripped from their hinges and thrown inside the compartment (McGrath 1947). Even with all of this happening, Lockheed officials stated that the passengers “hardly knew anything had happened until the plane landed at Gander” (AP 1947). asleep in the rear of the passenger cabin. was in the galley following a routine inspection of the aircraft. was in the cockpit at the controls. asleep in the navigator’s caompatment. asleep in the passenger cabin. in the navigator’s compartment presumed to be standing on a stool with his head in the astro-dome taking a star shot. Inside the aircraft taken in Gander after the incident. From the collection of Darrell Hillier. 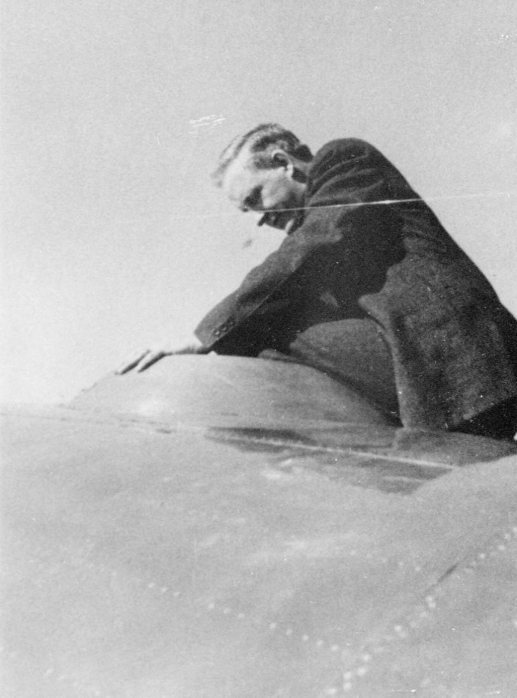 First Officer depressed the nose of the aircraft and began immediate descent; the Flight Engineer operated the emergency valves to depressurize the cabin; the Co-Captain rushed forward to the cockpit and took over control; the Radio Officer tried to send an emergency message to Gander but was unable to do so. (It was later discovered that the radio antenna was damaged). The Stewardess and Flight Purser went back to the cabin to attend to the passengers and administer oxygen to three of the occupants, the remainder being unaffected by the loss of pressure in the aircraft (McGrath 1947). A radio message was later received by Gander, reporting the incident at 10.15 local time. As the aircraft was only 500 miles south-east of Gander, so when the aircraft was under control, the Captain decided the return to Newfoundland. The doors to the navigator’s compartment were fixed, and the aircraft was repressurized to the point that the pressure would hold the door to the now open compartment. A search was then conducted for the navigator, but he, nor his sextant or chronometer, could be found. It is assumed that he was using the equipment at the time of the incident (McGrath 1947). Notification was sent out through the Coast Guard to all ships to be on the lookout for the navigator, but as he had dropped four miles into the ocean, there was little chance of survival (AP 1947). The aircraft returned to Gander at about 0400 GMT and passengers had to wait for another aircraft to be sent up from New York before departing for Shannon, Ireland (AP 1947; McGrath 1947). The reason for the failure of the astrodome could not be explained by the crew. The cabin was not pressurized to the maximum, so it would be unlikely that the failure was due to excessive pressure in the cabin. And even if it were excessively pressurized, the relief valves would have prevented excess pressure. This was also unlikely because there were remains of plexiglass on the mounting, which suggested that the astrodome broke instead of coming loose and breaking free. Another theory put forward was that in extremely cold temperatures the plexiglass of the astrodome can become brittle and can shatter. At the time, the outside temperature was -20 C, so the cold causing it to shatter was unlikely because such equipment had been tested up to -50 C. Another possibility was that if the antenna had broken previous to the incident, and had been flapping in the airstream, it may have hit the dome and shattered it. The final theory was that Hart himself knocked against the dome or hit it with his sextant while he was taking a star reading. This theory is also unlikely as the aircraft was flying in clear weather and there was no turbulence at the time of the incident (McGrath 1947). As this incident happened outside of the jurisdiction of Newfoundland, no further investigation occurred to be kept in the Newfoundland records (Walsh 1947). The matter was passed on to the US authorities (McGrath 1947). 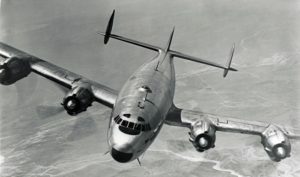 As a result of this incident, Lockheed technicians with the Civil Aeronautics Authority conducted investigations with Constellation at 20000 ft, but found that breaking the window caused little more than a condensation vapour, like what occurred in this incident (AP 1947). McGrath (1947) reports that a similar incident had occurred with a British Overseas Airways Corporation flight where the astrodome failed, but nothing was lost but some papers. TWA also developed further safety measures, working to change how star readings were taken to eliminate the need for astrodomes. As well, harnesses were installed for the navigators to wear, and within 48 hours of the incident, all domestic Constellations in the TWA fleet were fitted with an aluminum alloy dome as star readings were only necessary for overseas flights. TWA also reported that Lockheed was already working on improving the strength of the astrodome (Lovett 1947). 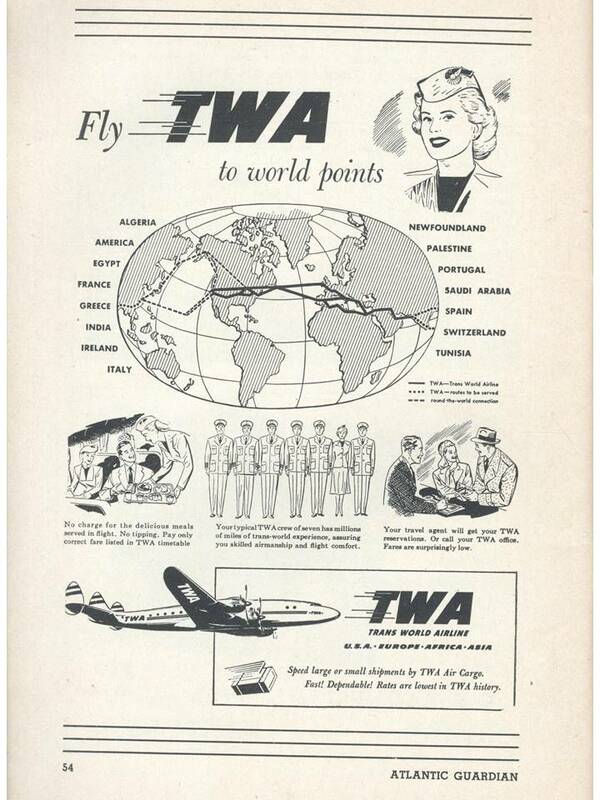 TWA advertisement from Atlantic Guardian 5(5) August 1948. 1947 TWA Navigator Thrown Out of Fast Plane Into Atlantic. Reading Eagle, 11 March 1947, p. 6. 1947 Act to Bar Future Astrodome Failures. Starliner of Trans World Airline, 2(14): 2. 1947 Report on Loss of T.W.A. Navigator from Constellation Aircraft in Flight march 10, 1947. On File PANL AG/57/8, no. 7. 1947 Letter to Hon. Commissioner for Public Utilities and Supply from A.J. Walsh Commissioner for Justice and Defence. On File PANL AG/57/8, no.8.